I'm not certain if this qualifies as a tip - there's no definitive "do this instead of that" in this post. But, I noticed differences in how the automatic Curves adjustment gets applied depending on how it's invoked. The curve is subtle. But it's not the shape of the curve I want to point out. It's the black and white points. They have not changed. Here, notice the black and white points have shifted inward abutting against the luminance curve (yes, hard to see on the white point, but it did actually change). And the increase in resulting contrast is clear between the two images. I find this interesting because, intuitively, I expected the automatic adjustment done by Auto-Enhance to be the same as what's done via the Curves brick. But obviously they're using different algorithms. Perhaps the assumption with Auto-Enhance is that you've corrected the exposure previously in the Exposure adjustment brick (which I'll stipulate I did not do with this image). And, other than looking at the Curves brick, I've not been able to devise a method to distinguish how the Curves adjustment is applied. 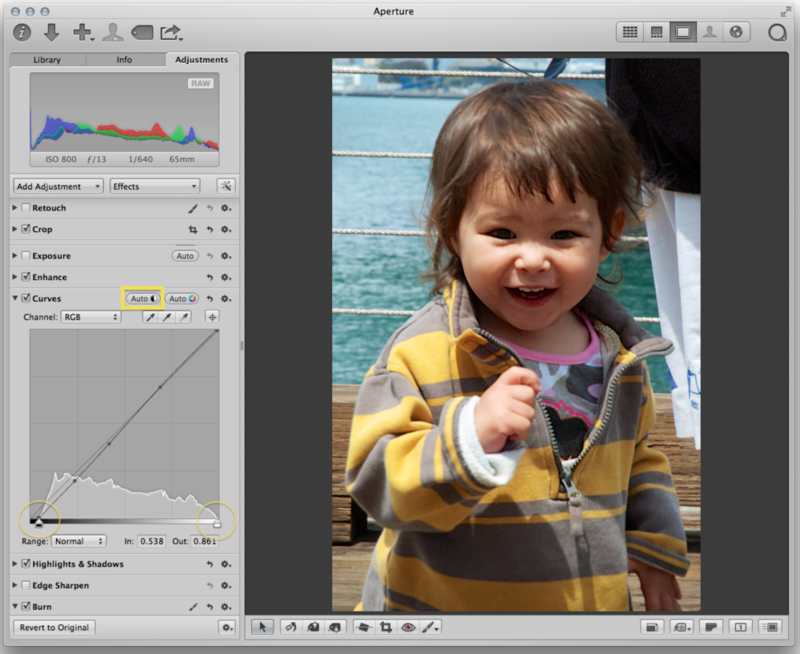 When lifting adjustments, for both of the images above the adjustment appears as "Auto Curves (Luminance)".